Retinopathy of prematurity (ROP), previously known as retrolental fibroplasia (RLF), is a proliferative retinopathy that develops in premature infants. It affects the Retina of Premature infants. Term infant or maturity is called as normal birth happening after completion of 9 months ie 40-42 weeks of pregnancy. Normal development of Retina completes at maturity ie 40-42 weeks hence birth before term halts the process of normal retinal development and cam lead to Retinopathy of prematurity (ROP). ROP affects about 90% among infants having birth weight less than 750 gm and 85% among those with gestational age of 26 weeks or less. Such premature infants because of their low birth weight needs to be admitted in NICU for prolong period till they achieve maturity. During stay in NICU they are given supplemental oxygen treatment for immature lungs. With advancement of neonatal care, incidence of ROP is on rise as survival rate of extreme premature babies has increased. Screening is best way to detect presence of ROP in infant so as treatment can be started at earliest before it causes irreversible vision damage. 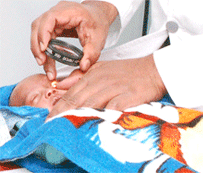 This is non-invasive way to detect presence of ROP in infant. Involves instillation of certain eye drops followed by Retina examination by trained Ophthalmologist. Neonates are best examined in the neonatal unit itself under supervision first, follow-up visit after stabilization can done at ophthalmic set-up. The first screening should be done within 4 weeks (30 days) of life in infants with prematurity >28 weeks. Screening should be done earlier (2–3 weeks after birth) if prematurity is <28 weeks or birth weight is <1200gms. If child gets discharged before these dates, then treating pediatrician will tell to take infant at appropriate date to visit ophthalmologist. Dr. Yogesh Patil (MBBS, MS (Ophth), Fellow Vitreo-Retinal Surgery) is a Vitreo- Retinal Surgeon at Advanced Eye Hospital and Institute. He has achieved remarkable competence in the treatment of various diseases involving the retina, vitreous and macula as well as in performing various Vitreo-retinal surgeries. Advanced Eye Hospital and Institute in Navi Mumbai is one of the best eye hospitals in Mumbai. Eye check-up rooms and the operation theatres are state-of-art and equipped with the best diagnostic and surgery machines. Personalised care, infection free modular operation theatres and beautiful ambience compliment the cutting-edge eye care offered at AEHI. Besides treating patients from Kharghar, Nerul, Seawoods, Belapur, Airli, Ghansoli, Vashi and Panvel, patients from all over western India travel to AEHI for world class eye care management.